The finalized TPP opens up 3.25 per cent of Canada's dairy market to foreign products. Right away, Stephen Harper announced that his cabinet has approved a plan to spend a hefty $4.3 billion in compensation to soothe the vocal dairy industry. It would be another whole day before Harper announced the significantly lower $1 billion in compensation for the auto sector. Canada just entered the global tax subsidy race, and the dairy industry got the first golden egg. 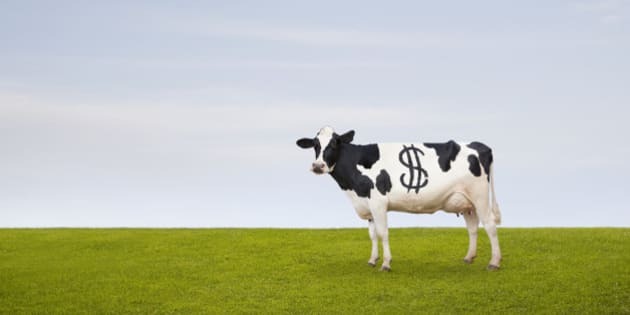 A Holstein Dairy cow with spots in the shape of a dollar sign stands in a pasture. In their recent annual report, the Dairy Farmers of Canada reassured that the Trans-Pacific Partnership (TPP) negotiations were going to be okay. The trade talks were so secretive that the general populace had very little details about the looming agreement, yet the Dairy Farmers said with confidence that "despite mounting pressure from the United States, New Zealand and Australia, the Canadian negotiators' mandate remains to not concede any access for supply managed products. Indeed, the finalized TPP opens up 3.25 per cent of Canada's dairy market to foreign products, lower than the rumoured 10 per cent. Before the Canadian Government sent out their press release announcing that after more than five years of negotiations, trade ministers from 12 nations have reached a tentative agreement, the Dairy Farmers of Canada set out a simple celebratory tweet: "No negative impact and supply management preserved for the next generation." Right away, Stephen Harper announced that his cabinet has approved a plan to spend a hefty $4.3 billion in compensation to soothe the vocal dairy industry. It would be another whole day before Harper announced the significantly lower $1 billion in compensation for the auto sector. Canada just entered the global tax subsidy race, and the dairy industry got the first golden egg. To put it mildly, Canada's dairy industry is politically influential. Even with the number of dairy farms dropping by a staggering 91 per cent in Canada since 1971, they have managed to still impose their implied influence over politicians. Even as milk sales continue to slide, with diets and society shifts away from dairy, their lobby efforts have increased. After Harper tasted the sweet victory of monopoly-breaking when the Conservatives dismantled the Canadian Wheat Board (and eventually sold it to water-poor Saudi Arabia), it was not much of a secret that the dairy lobby was getting ready for a fight to preserve their supply management system. Since TPP negotiations began more than five years ago, the federal lobbyist registry shows that dairy lobbyists have had more meetings and communications with federal representatives than any other industry. Astonishingly, for many recent years, the national dairy lobby have had almost three times as much communication with designated public office holders than Enbridge, TransCanada and the Canadian Energy Pipeline Association combined. One of the Dairy Farmers' retained lobby firms even poached the director of communications for Canada's International Trade Minister who was negotiating on TPP. His bio now reads that he "played a leading role in" Canada's Trans-Pacific Partnership, adding that he also previously worked as an advisor in the Prime Minister's Office. Well-placed government connections can lobby to keep industry in charge of policy. The national dairy lobby is behemoth comprised of a network of provincial and federal organizations that all fall under the brand of the "Dairy Farmers." It is estimated that the collective national dairy lobby spends $100 million a year on lobbying. That is more than the combined budgets of the five federal parties during the last election. $4.3 billion in subsidies is a lot to compensate for a small percentage of their domestic market share being open to competition. There are less than 12 thousand dairy farms in Canada, and their total net farm annual receipts only reach $6.07 billion. Even Harper called it "a very large compensation package," being careful to avoid calling it a subsidy. But compensation is a taxpayer subsidy. Before this TPP trade deal, the Canadian dairy industry didn't have direct taxpayer subsidies. In other countries, government subsidies to dairy farmers have bloated. For example, England's dairy farmers receive around a third of their income in EU subsidies. Elsewhere in the EU, 50 percent of farmers' incomes are from government subsidies. Canada's dairy industry has asked before for a subsidy and been rejected. Shortly after the supply management system was put in place, the industry was overproducing and the initial boom went bust. When in 1976, the government failed to grant subsidies to dairy farms, the result was a violent clash between farmers and police on Parliament Hill. Stepping to a microphone, the very man who instituted the supply management system a few years earlier was only able to say 'I am your Minister of Agriculture,' before he was hit in the head with a milk jug. The photo of spilled milk splashed across papers everywhere. Back then, Canada's dairy industry was mom-and-pop operations more in need of government help. Now it certainly is not. Statistics Canada shows that farms have been rapidly consolidating as farmers sell their quotas. Even though 25 percent of farms now produce the majority of Canada's dairy, Big-Ag farms have managed to brand the collective industry as small family-farms. From 2001 to 2011, Canadian dairy farms' net operating income almost doubled. Now, after years of protectionism, they get a subsidy as well as access to new foreign markets. Agriculture and Agri-Food Canada was quick to announce the details of the $4.3 billion. Contained within are programs like the $2.4 billion "Income Guarantee Program" which will provide "100 per cent income protection" to dairy farmers for a total of 15 years (including a five year phase-out). What other occupation gets 100 per cent of their income protected? But the problems go deeper, the Government of Canada says that income guarantee payments will be "calculated based on expected domestic production levels." Meaning supply, not market demand will dictate payments. This is key, since the industry chronically over-produces and then dumps product. The Dairy Farmers of Ontario alone acknowledged that they produced 5.4-million litres of excess skim milk in one month alone and that this spring they dumped roughly 800,000 litres of milk into manure lagoons due to low demand. The industry's history of dumping milk was reflected metaphorically in their protest the week before the TPP agreement was met. Dairy farmers converged on Ottawa to protest the possibility that supply management would be significantly affected. With farmers walking their cows on Parliament Hill, the action was no doubt crafted for the optics. But when they dumped milk on the pavement, eyes critical of the power of the dairy lobby in Canada instead saw a metaphor of the excess and waste of the industry. One of the Canadian dairy industry's dirty little secrets is that supply management requires chronic overproduction, and now Canada is offering a massive subsidy based on their inflated production levels. It appears that compensation will be without consideration for the declining demand for dairy, which is decreasing globally as consumers switch to alternatives such as almond, soy, coconut and rice milks. The Dairy Farmers of Canada said that the consumption milk has decreased a dramatic 25 per cent in the last 20 years. Consumption rates will likely fall further as more studies show that high dairy intake is potentially detrimental for healthy bones and a healthy body, and as more undercover videos document the animal abuse on factory farms. A main criticism of TPP is that it's not about free trade, it's about providing additional power for corporations. Canada's dairy lobby has shown us that those days are already here.